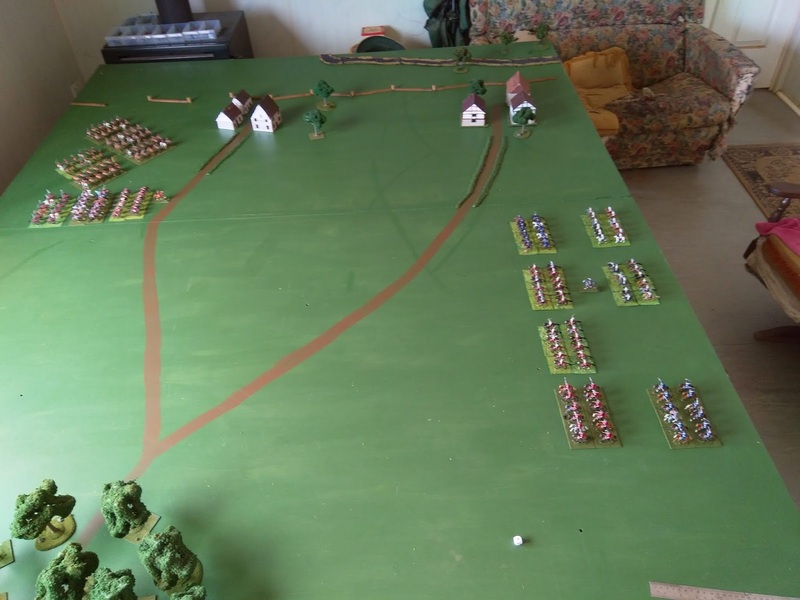 The view here is from the West, towards the Lines of Brabant, with the English cavalry approaching from the North and the considerably numerically and qualitatively inferior French cavalry lined up nearer the camera towards the South. If you look carefully you will see not one, but two sunken roads, which would serve to sink hopes as well as travellers, especially the one on the English side of the battle, where the cavalry were jostling for position, Hay and Ross' Dragoons following Lumley and Wood's Horse, confident they would outflank to the East and then overcome the Gardes du Corps and the Bavarians. What could possibly go wrong? Everything, of course, and here from Move 2 is the disaster just about to unfold. 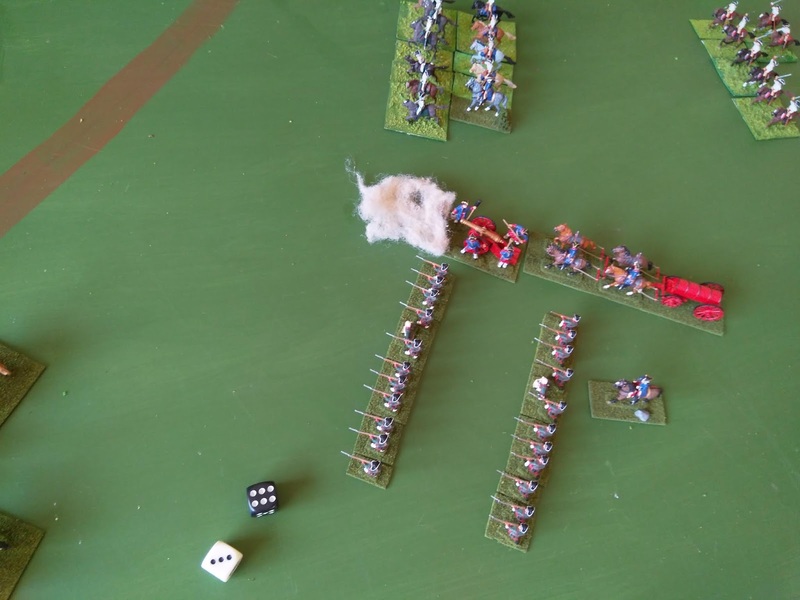 The English cavalry have managed to throw away their advantage in numbers by failing to deploy remotely properly behind an over-eager, over-confident Duke of Marlborough himself. We decided to allow oblique movement, but even without it, the French would have been able to concentrate on those leading Horse and defeat them in detail, which is exactly what they proceeded to do - aided somewhat by poor luck, to be fair to me. 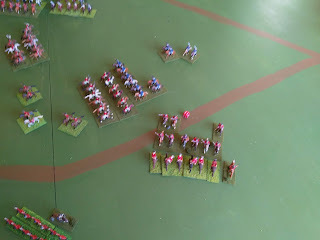 A brisk exchange of carbines, out of which the English came off worst, occasioned some self-doubt about whether the Zimmermann ANF-WSS rules were exaggerating casualties - but we immediately recalled that previous actions had brought about very historically accurate casualty numbers, so these doubts were cast aside. And thence to melee, where readers will scarcely be surprised to learn that the English came off worst again. We may have only been at the end of Move three of a ten move game, but the sense of defeat was already beginning to permeate through the English lines, and morale - not least mine, but also of the units involved - was about to crack. 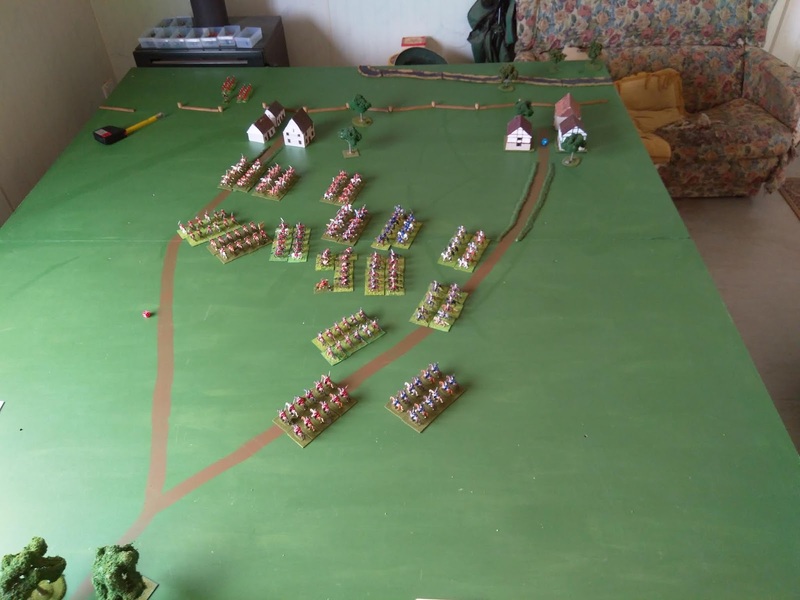 And so it did, with no fewer than four English and German cavalry units suffering a panic test as a result of a disorderly withdrawal from defeated cavalry in melee.Only Cadogan's Horse succeeded in rallying, the other three ended up off board for the maximum possible three moves. That's the brave Saxe-Gotha Horse you can see on the left front of the picture above. Now the English were at a decided point of inferiority, although I had already reached the point of actually being quite grateful that they were not completely lost, and unable to be sacrificed piecemeal as I seemed intent on doing with the rest of the force. 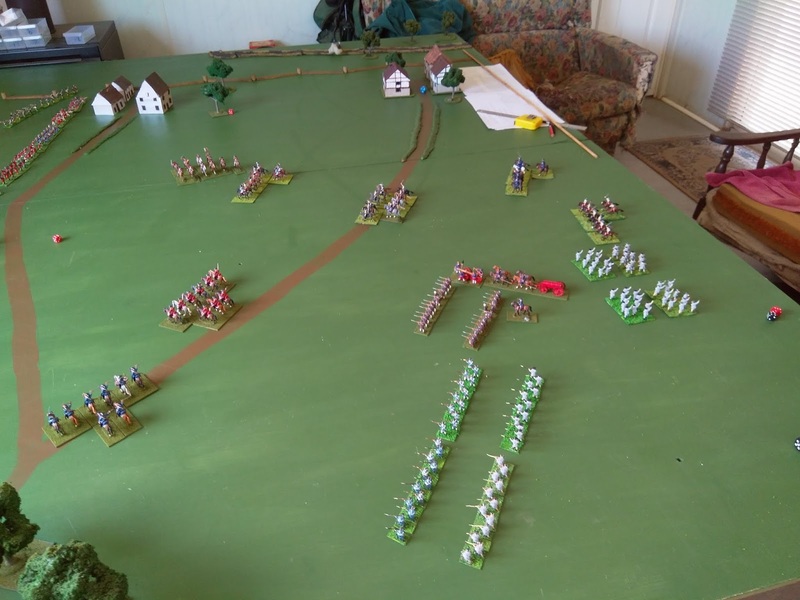 From the overall view above you can pick out Churchill's regiment advancing across the Lines of Brabant at the head of the English infantry; equally at the top right of the photograph the French and Bavarian artillery and infantry of Lt-Gen Caraman can be seen. Sensibly the Vicomte d’Alègre, who was having an excellent day, had already withdrawn some of his cavalry in order to prevent their total loss. Others continued to press the attack home, with considerable success. Indeed, the Duke of Marlborough was almost himself captured by French cavalry, as the encounter in the West continued to go badly for the English. The result by the end of Move 6 was that the French cavalry victory was already quite evident, even if it was also apparent that the opposing lines of infantry would not actually become engaged before the French would be forced under the scenario to withdraw at the end of Move 10. In keeping with the rest of my poor decisions in the battle, the French artillery was now able to make play with the exposed English cavalry formations. Scratch the Hanover cavalry, despite their honourable performance until that moment. The Dutch artillery, far away behind the Lines of Brabant, had also made an appearance, and did also succeed in breaking a French cavalry unit, but it was scant compensation, as the level of casualties on the English reached the point by the end of Move 8 for an Army test at the 1/4 level to be required - which I passed, to be fair, but was now standing entirely on the defensive. 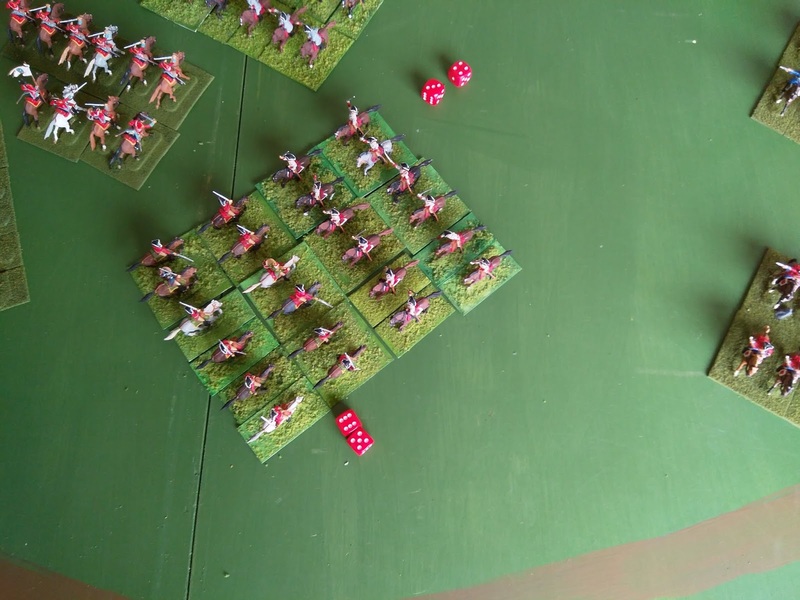 Grateful for my returning cavalry, they were flung into action on Move 9 against the oncoming French dragoons, to some effect, but it was too little, too late. 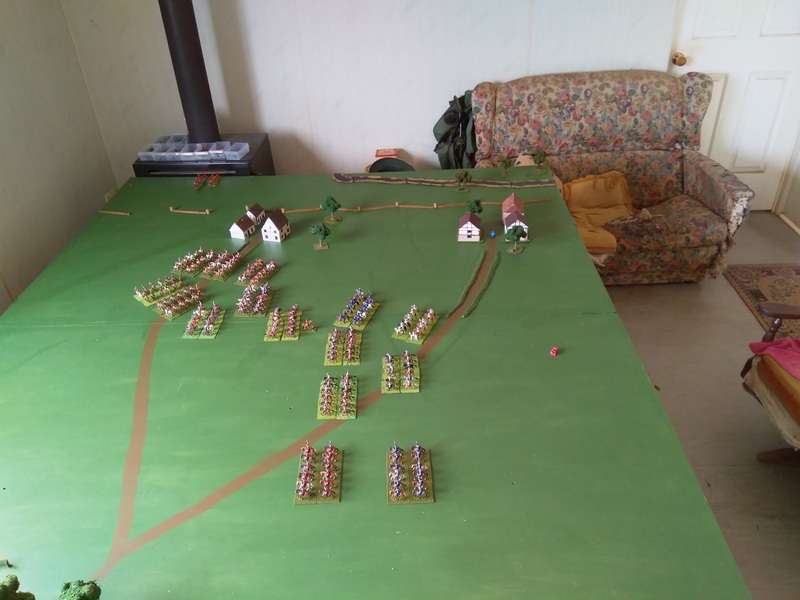 As dusk descended across the battlefield, and just as importantly, the sight of dense Dutch flags to the West alerted the Vicomte d’Alègre to the oncoming menace - his army also passed a 1/4 test, and the English, a 1/3 test. 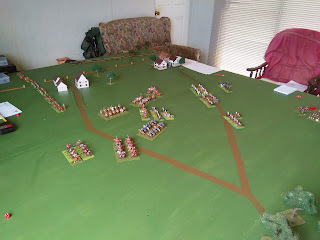 But only one more move remained to us, and there was no victory to be had for the Duke of Marlborough. His Tory enemies at home will have been animated by the dismal news of a thousand English cavalry dead, when it eventually reached them. Not enough, perhaps, to ensure his dismissal, but a tarnish to that illustrious reputation. And evidence, certainly, that War of Spanish succession battles are won by correct deployment, steady fire, and a measure of good fortune. Many thanks to Mark for hosting, and for painting so many of the figures, borrowed from his Seven Years' War collection. And to James for stepping in with photos when my camera died on the day, along with my hopes. Who says the vanquished never write the history? "Who says the vanquished never write the history?" Not me for sure! You only got that decent shot with the artillery 'cause you borrowed my good dice, hahahahahaha!!!! I'm so glad you were there to participate in my downfall! Still mare for a good report! Hubris was my undoing, Gonsalvo! How can I make it to the ghost of the noble Duke? At Blenheim, eventually, I hope - these WSS battles are leading to it, just as our Napoleonic naval battles are leading to Trafalgar..